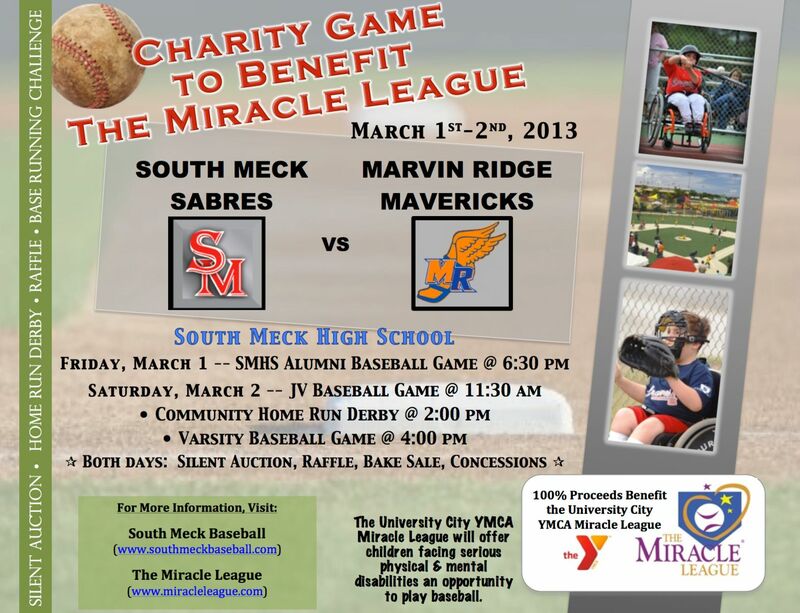 The 2013 fundraiser for The Miracle League was held on Friday night March 1 and Saturday March 2. Friday night featured our alumni baseball game with players young and old joining in a fun evening. Saturday featured our bake sale, silent auction, home run contest all during the JV game and prior to the start of the Varsity game against Marvin Ridge. The day also featured snow, then rain, a little sun and finally a hail storm that suspended the Varsity game in the early innings. The baseball team raised $4,635 in the program’s second YMCA Miracle League fundraiser. The team presented the check to Paul Petr, University City YMCA executive director, before its March 22 game against Myers Park. The YMCA Miracle League at the University City YMCA is a baseball league for children with special needs. Games are played on a rubberized turf field that is handicap accessible. The league played its first season in the Fall of 2012. Spring 2013 season opened up on April 13, which the South Meck baseball team attended and re-presented their fundraising check to Paul Petr of the YMCA.